I find some pretty cool things at garage sales. Sometimes some of the most random things are the things that I have the hardest time passing up. A few months ago, I picked up a ziploc bag full of goose feathers. The family had a goose as a pet and apparently he shed. A lot. 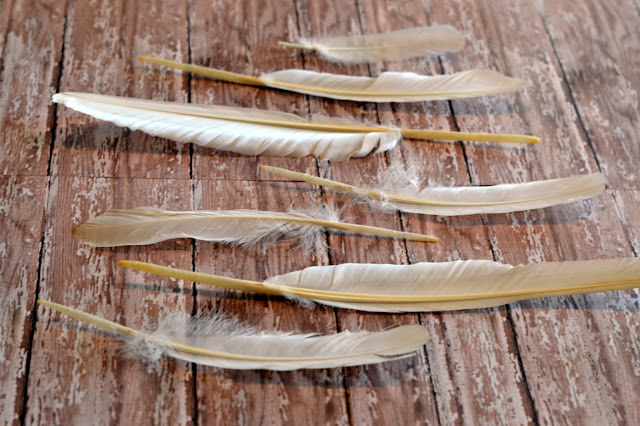 So for $1, I got a whole bag full of some pretty sturdy white feathers and for months they sat in a drawer because I wasn't quite sure what to do with them. 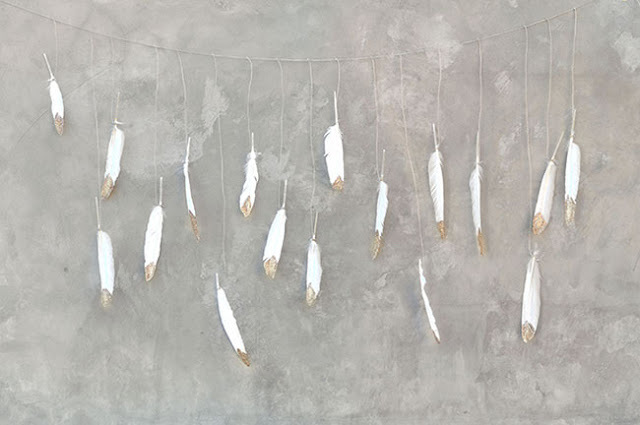 But alas, don't you worry, I came up with a cool use for those goose feathers. 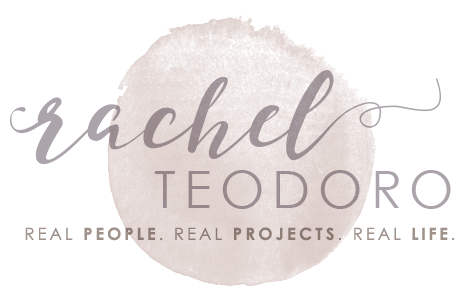 I love that I can use them for a few different things and hopefully, it will give you some inspiration to start creating if you happen upon your own bag of feathers at your next garage sale. My most favorite in all of the lands metallic paint is Deco Art Americana multi surface paint. The gold paint is my favorite. 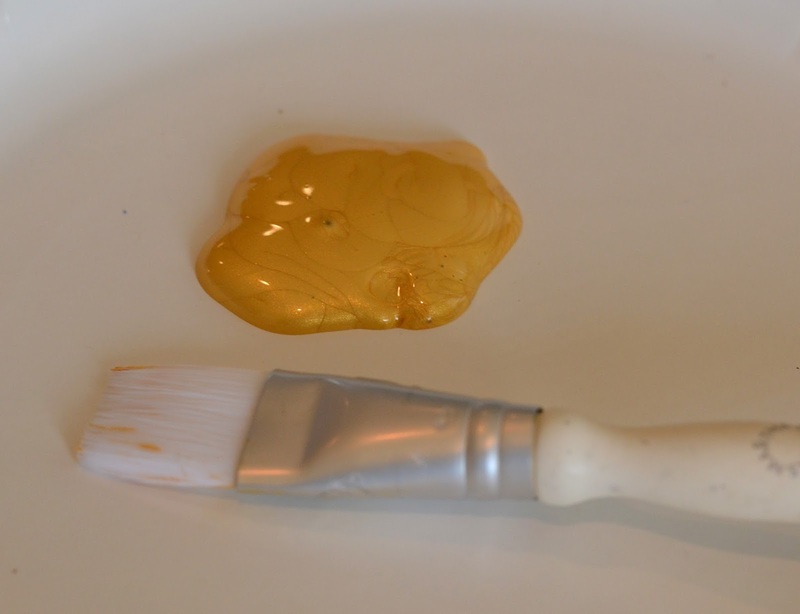 I have found that some cheaper paints just don't give you that shimmer and shine the way that the Deco Art gold paint does. 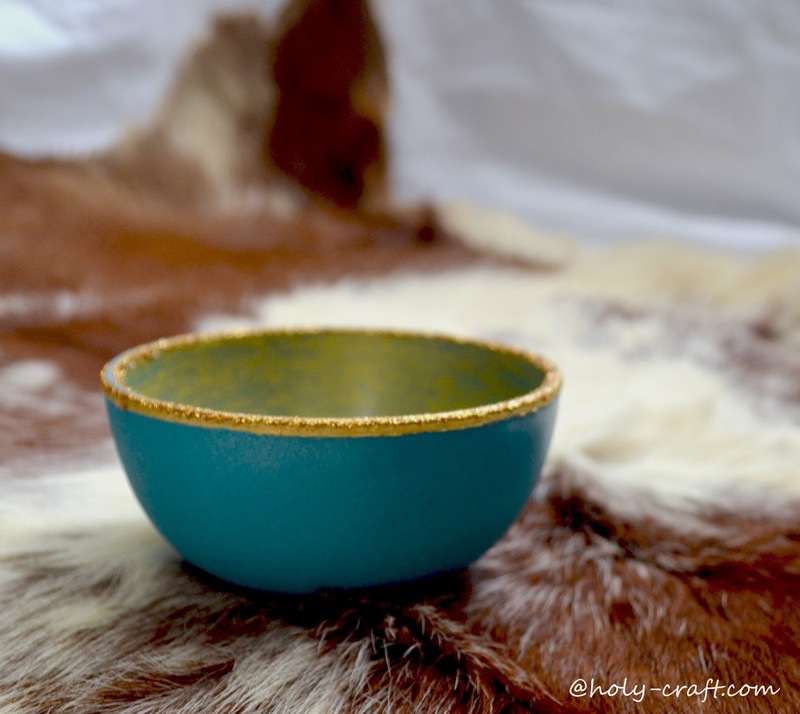 If you need a refresher, I also used the gold paint to create this turquoise and gold painted bowl. See how pretty it is? It just gives you this great coverage and shiny finish. O.k., back to the feathers. 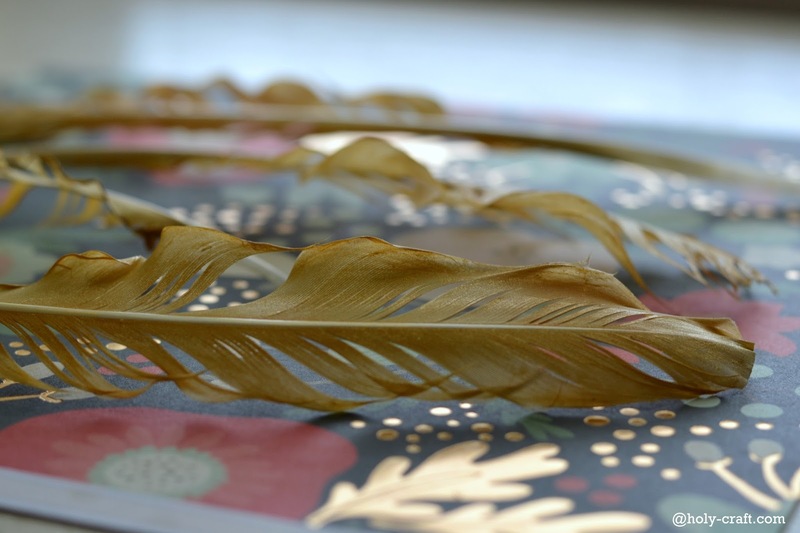 So I took the feathers and a brush and lightly brushed gold paint onto them. Once the paint dries, the feathers will dry together, so if you want to separate the feathers to give them some dimension like I did, you simply take your brush as you paint them and brush up, the opposite way that the feathers want to go. Let the feathers dry for about an hour. Look how pretty they are now! They look like they came from a golden goose! Now comes the fun part. What to do with them. You could string them to make a garland like Green Wedding Shoes did. 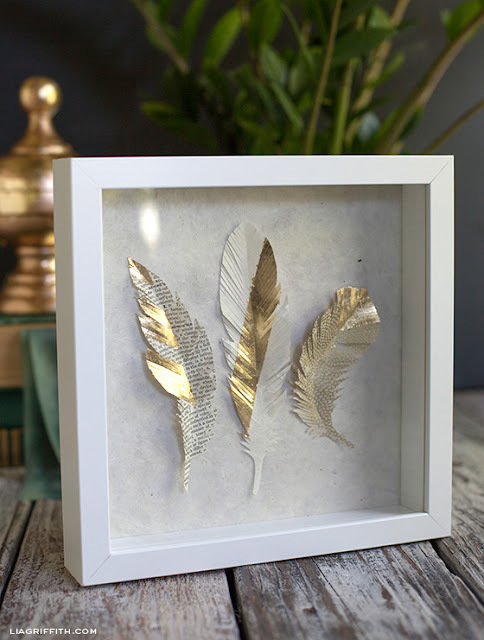 They also would make a great display piece if you mounted them in a shadow box like Lia Griffith did. source The possibilities are endless! 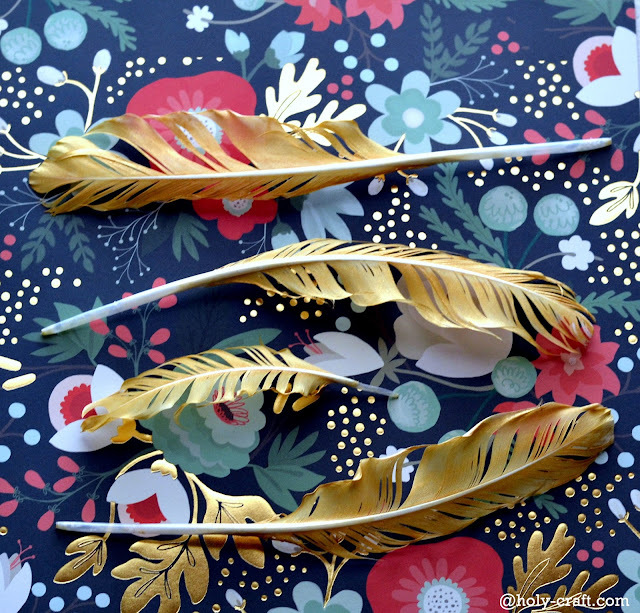 What would you do with painted gold feathers? 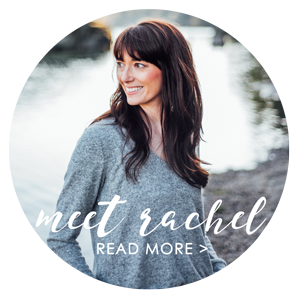 Gift ideas for creatives for under $20! Creative Gift Ideas for Kids Under $20!